Createspace Independent Publishing Platform, 9781463739799, 122pp. 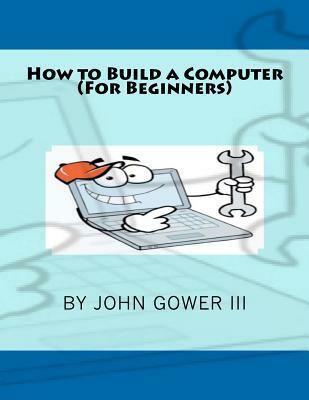 The book, "How to Build a Computer (For Beginners)," outlines step by step instructions on how to build a computer from the bare bones to the finished product. The book includes a list of choices for tools and supplies necessary to successfully build a computer on your own; using the author's educated knowledge and background on computer software and hardware. John Gower III was born in Jamison, Pennsylvania. John attended Bangor Area High School, graduating in 2003. John attended college at Information Computer Systems Institute in Allentown, Pennsylvania, where he graduated with an associates degree in Business/Data Networking in 2005. John now has numerous years of experience in computers working with software, hardware, networking, and web design. John also has certifications in the field of computers. John started writing books later on in his life. He published his first book on July 1, 2011 called, "How to Build a Computer (For Beginners)"(c). John published the AMAZON BEST SELLER book titled, "How to Spot Scams Online." John just released his first children's book titled, "Kitty's Quest To Find Her Food." John Gower III is the author of countless books published worldwide! Learn more about the author John Gower III by visiting his website at http: //www.jghitech.com for more information. Follow John Gower III on Facebook & Twitter.